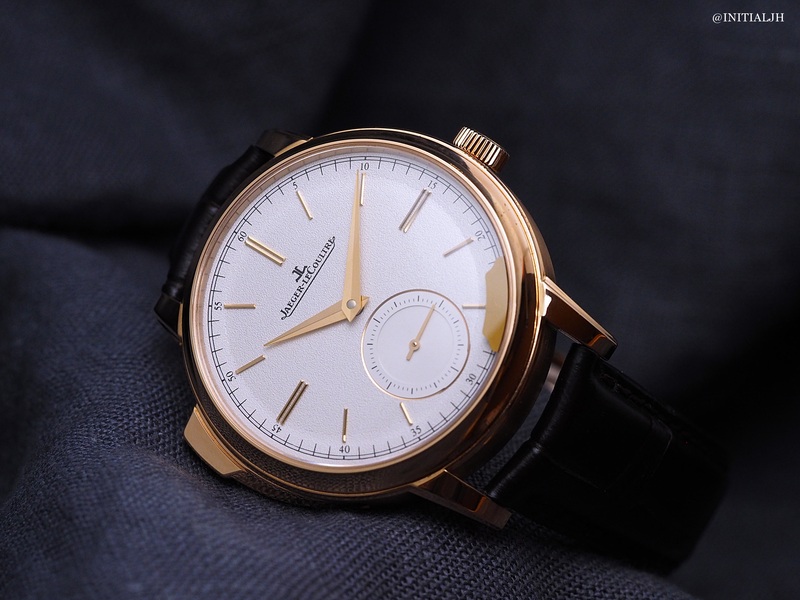 Jaeger-LeCoultre recently launched a new pink gold 39mm Minute Repeater for which we had the opportunity to see the (then embargoed) prototype during SIHH 2015. An addtion to the Master Grande Tradition line, the Master Grande Tradition à Répétition Minutes may remind you a bit size and movement wise, of the Ivy Minute Repeater. 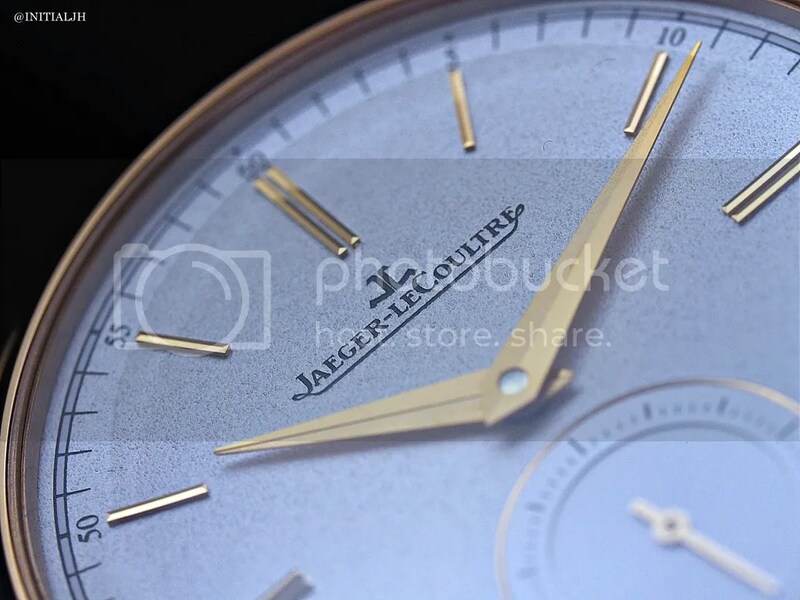 So with this complication clearly not being new to Jaeger-LeCoultre, what is special about this one? Well it’s the first automatic minute repeater in the Master Grande Tradition collection. Minute repeaters are obviously all about the sound and how it is transmitted from the gongs through the watch. 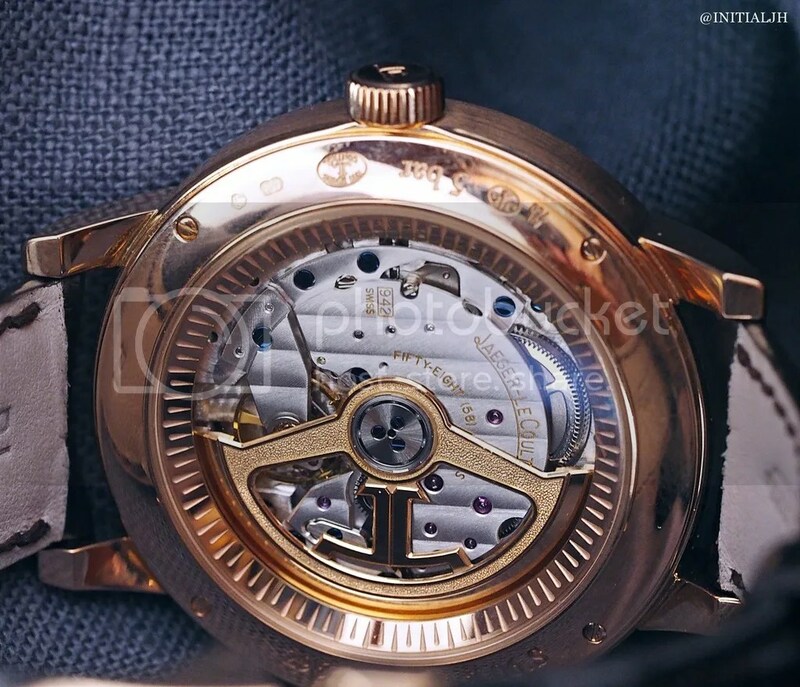 For the Hybris Mechanica Grande Sonnerie (2009) traditional hammers were replaced by what are called ‘trebuchet hammers’, and this new minute repeater uses these patented hammers, which strike two crystal gongs connected to the sapphire crystal via the ‘heel’. To read about trebuchet hammers, go to this link. The ‘heel’ (or ‘foot’, people seem to vary in terms of their preferred body part) of the gong has a rather unusual placement – it is welded to the sapphire crystal on the top of the watch so that it can act as a ‘louspeaker’ to amplify the sound of the gongs. It is that small blank ‘plaque’ in the photo. Bear in mind that this was prototype that we saw; there has been text (‘Sonnerie’) seen in official photos that have been subsequently released. Whether or not you like this ‘signage’ will be subjective. You will note that on the Ivy, the text is branding. What is interesting however, is that if you look back through some of Jaeger-LeCoultre’s minute repeaters you will notice other appearances of similar plaques/ feet/ heels, but situated in a variety of places both in front and on the rear of the watch. I admit that when I saw different placements for watches using the same movement I could not work out why – surely, I thought, if it is the same movement and if it is about sound magnification, then this ‘heel’ would be in the same/ very similar location in all the watches containing the same movement? Well it seems that this is not the case (no pun intended) and it also reinforces why, for so many reasons, I could never be a watchmaker – the differences are because the acoustics of each minute repeater model vary according to the materials used (especially the composition of the dial) as well as any additional features. So given that minute repeaters are watches that are individually ‘tuned’, as it were, the positioning of the heel will vary even between this model and the Ivy Minute Repeater. These gongs with their heel/ crystal attachment have been used since the Master Minute Repeater (2005). As was the case with the Ivy, the repeater function is activated not by a traditional slide which is often the visible identifier that a piece is a minute repeater, but by a pusher, adding to the slimness of this piece. The rationale given for this is that the pusher is designed so that once activated, it cannot be re-activated whilst operational, say by an over inquisitive toddler, thus preventing any damage to the movement. In terms of the sound, and again it needs to be emphasised that this was a prototype piece, it was reasonably loud and clear even with constant background noise from a nearby presentation. We listened to two Jaeger-LeCoultre minute repeaters during this meeting and both preferred the Master Grande Tradition Grande Complication soundwise but as a watch, this new one. If you want to hear the same movement but in its finished elder sibling (better than listening to the prototype), click here. As mentioned, the Cal 942 movement used in this new model is the same as that used in the Rendez-Vous Ivy Minute Repeater which Sydney was fortunate to first to see before its formal launch at Watches & Wonders 2014. The Ivy Minute Repeater clearly isn’t for everyone, not least of all because of pricing limitations, but for those liked the movement and who want a cleaner aesthetic, this just might be the one for you. The Cal 942 is a 26 mm in diametre, 7.17mm thick, consists of of 437 parts, has a 28,800VPH, and a power reserve of 40 hours. It is finished simply, but perhaps this is to match the simplicity of the dial. Is 39mm (and 12.1mm thick) too small? Most definitely not, and it is of a size where it will be accessible to a greater range of people, as well. Is it too big? 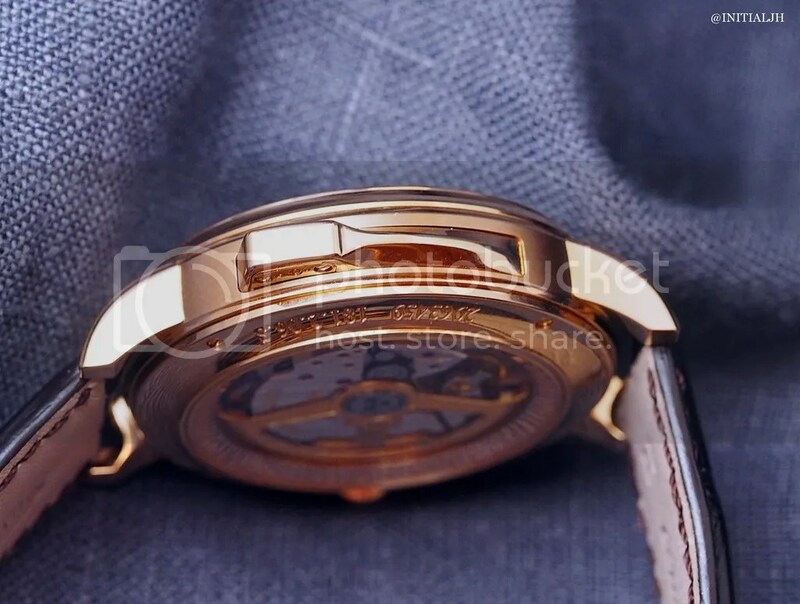 Well there are definitely those who think that classic dress watches are preferable perhaps 1-2mm smaller than this but really, there’s not that much in it for this particular watch when it comes to how it will look on the wrist. The case is a combination of polished and brushed parts. 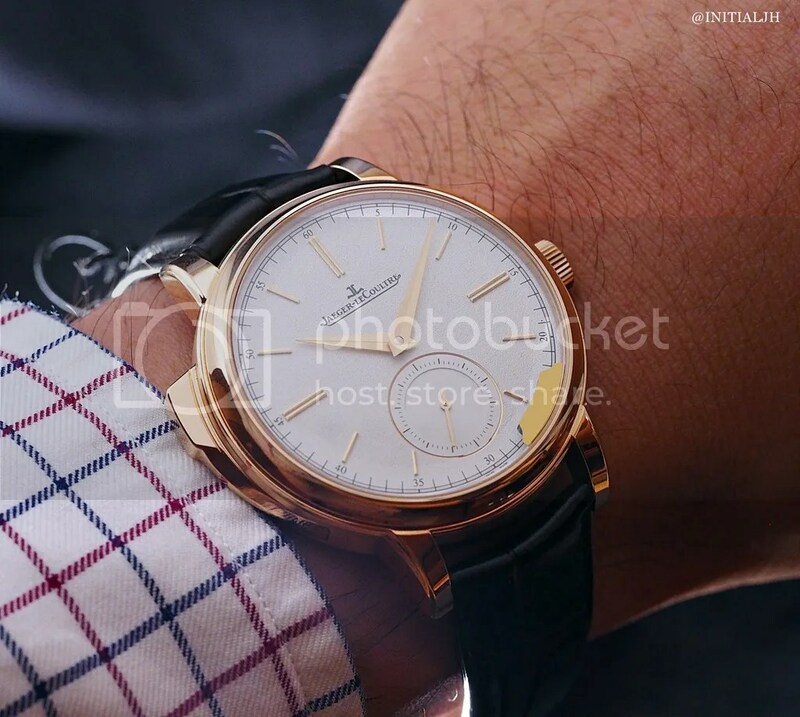 Its dial is silver grained which gives it some good textural interest, and its hour markers are applied pink gold. The dauphine hands are faceted, which means that one side is polished, the other brushed. It is very classic, elegant, and understated. Pricing is 140,000 EUR (ex VAT), which makes it a fraction under AUD200,000 (ex GST). probably my favourite for SIHH2015. understated and yet complicated.